1 of 4 In a small microwave-safe bowl, stir together the marmalade, soy sauce, plum sauce, vinegar and garlic powder. Cover with microwave-safe plastic wrap and vent slightly. Microwave on full power for 3 minutes. Set aside. 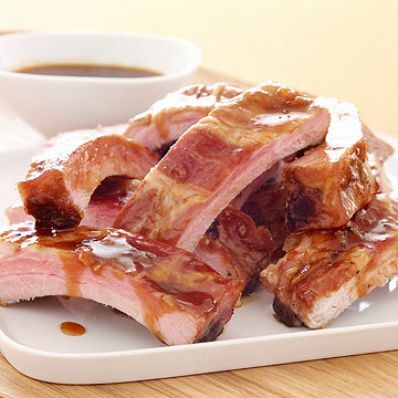 2 of 4 Fit ribs into a 10 by 10-inch microwave-safe dish. Cover with plastic wrap and vent at one corner. Microwave on 50% power 25 minutes. Carefully drain liquid from dish. 3 of 4 Brush ribs with 1/2 cup of the sauce. Cover and microwave on full power for 5 minutes. Let stand, covered, for 10 minutes. 4 of 4 Serve with the remaining sauce on the side. Per Serving: 9 g sat. fat, 289 mg sodium, 370 kcal cal., 26 g Fat, total, 103 mg chol., 0 g fiber, 25 g pro., 8 g carb.